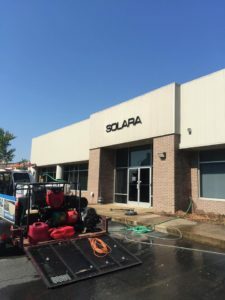 J&L Professional Services offers pressure washing services that will keep your Raleigh shopping center or strip mall walkways, driveways and parking areas looking clean and welcoming. We use temperature controlled water to ensure stains, gum, oil, and grime are removed. Our biodegradable detergents are environmentally friendly and can clean dirt away in seconds without damaging the surface. Most of our service can be done off hours when public traffic is minimal.